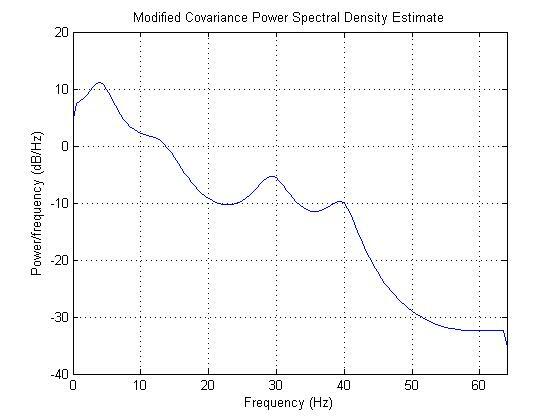 How do we interpret a power spectral density plot. I have used modified covariance and burg methods and plotted using MATLAB. What does the peaks at some frequencies suggest? and what is the difference between positive and negative power in the graph? how do we know that which frequencies variations are strong and at which frequencies variations are weak.. can anyone help me please.. The plot is not of power. The units of the $y$ axis are dB/Hz. The dB part means that a decibel scale is used, which means it is a scale relative to a reference value. All that negative values on a decibel scale mean is that the actual power is less than the reference power (because the ratio is less than one). The higher the decibel value, the more powerful the signal. Your signal has a major peak at about 4Hz, and lesser peaks at 28Hz and 39Hz. There might be something happening at about 12Hz, but it's hard to say without more information (or data). Not the answer you're looking for? Browse other questions tagged power-spectral-density covariance or ask your own question. Difference between Power spectral density, spectral power and power ratios? What is the power spectral density after filtering?